Today I would like to proudly introduce Steven Manchester onto this new platform of mine. Rick and Abby grew up together, became best friends, and ultimately fell in love. Circumstance tore them apart in their early teens, though, and they went on to lives less idyllic than they dreamed about in those early days. Rick has had a very successful career, but his marriage flat-lined. Abby has a magical daughter, Paige, but Paige's father nearly destroyed Abby's spirit. Now fate has thrown Rick and Abby together again. In their early thirties, they are more world-weary than they were as kids. But their relationship still shimmers, and they're hungry to make up for lost time. However, Paige, now nine, is not nearly as enthusiastic. She's very protective of the life she's made with her mother and not open to the duo becoming a trio. Meanwhile, Rick has very little experience dealing with kids and doesn't know how to handle Paige. This leaves Abby caught between the two people who matter the most to her. What happens when the life you've dreamed of remains just inches from your grasp? Author Bio: Steven Manchester is the author of The Rockin' Chair, as well as the #1 best seller, Twelve Months (2013 San Francisco, DIY & New England Book Festivals award winner). He is also the author of A Christmas Wish (Kindle exclusive), Goodnight, Brian (2013 Southern California Book Festival award winner), and Pressed Pennies (due out May 2014). His work has appeared on NBC's Today Show, CBS's The Early Show, CNN's American Morning and BET's Nightly News. Three of Steven's short stories were selected "101 Best" for Chicken Soup for the Soul series. When not spending time with his beautiful wife, Paula, or his four children, this Massachusetts author is promoting his works or writing. A mix of playful conversation and alcohol set the night’s happy mood. Rick was tipping his third beer at the season’s final bash when he looked up and saw her. He nearly choked on his drink. She was his age, pretty with an athletic build. She had gorgeous wavy chestnut hair with beautiful dark eyes that matched. She had a mysterious confidence about her and a smile that men would die for. Rick swore she had an aura from her head to her feet. At that moment, he thought, I have to meet her. His mind filled with questions that needed answers: Who does she know at the party? Who can I get her background from? Who can introduce us? As his mind raced, Carol walked over with the beauty. And as they got closer, it hit him. “Oh, my God!” he said. “Rick, this is…” the friendly hostess began to introduce with a smile. “Abby!” Rick interrupted. “I can’t believe it.” It was her. It was Abby Gerwitz, his childhood sweetheart. He searched her eyes and a thousand memories—happy childhood pictures—flooded his mind. And then he recalled the pain he’d felt on the day they were forced to say goodbye. After an unforgettable summer, Abby and the neighborhood gang received the terrible tidings. Rick—then known as Richard—gathered the gang in his backyard. He felt ready to cry. “I’ve got some bad news, guys,” he said. “What’s is it?” Grant asked. Richard looked at Abby. She was frozen. It was a lie. They were moving, sure enough, but Richard’s dad hadn’t been promoted. The hospital bills from his mom’s car accident—where a drunk driver had stolen away her life—had finally broken them. It was a matter of money or more precisely the lack of it. Richard silently vowed that he’d never be put in the same position—ever. No matter what I have to do, he swore to himself. While the rest of his friends hung their heads and complained, Abby burst out crying and ran for her house. As Rick recalled, it was well past midnight when he finally surrendered to the tossing and turning. Rolling out of bed, he maneuvered past several moving boxes, stepped up to the window and pulled back the curtain. Wilbur Avenue was deserted and silent. From left to right—as if he was branding the picture into his mind forever—he carefully scanned every detail of the place he could no longer call home. Although one good memory after another played out before him, a sharp pain pricked his heart. No one was watching, so he allowed the tears to flow. Once he’d arrived at the farthest reaches of his vantage point, he forced his swollen eyes to work their way back and absorb more of his past. “Why do we have to leave?” he muttered. “Why?” Before long, his shoulders rocked back and forth to the rhythm of his quiet sobs. The very next morning, gray clouds hovered over Wilbur Avenue. Richard’s dad and grandma made their goodbyes quick and waited in the overstuffed station wagon for Richard. Richard had never said goodbye before. The pain was alien. It hurt something awful to face Abby. Overwhelmed with emotion, it took him a while to speak. It was the hardest thing he had ever had to do. “Well, I guess…” Richard muttered, and choked on the words. Not knowing what else to do, he pulled the curled brim of his ball cap down further over his eyes. “Sure.” Richard was fighting to be strong and dared not speak more than a word. Abby lifted the brim of his hat. “Goodbye, Richard,” she whimpered. Richard placed his hand on her shoulder and shook his head. “No Abby…I’ll be seein’ ya,” he whispered, and with one surge of courage kissed her on the lips. While Abby’s eyes went wide, he pulled his baseball cap back over his eyes, jumped into the family station wagon and never looked back. One cruel moment later, the Giles family drove away. Though Richard and Abby promised to keep in touch, frequent phones calls and detailed letters gradually became an occasional event until adolescence rearranged priorities and their communication ceased altogether. Rick grinned. “It’s Rick now,” he said. She pulled away to peer into his eyes and, without a word, returned to their embrace. While they hugged over the unexpected reunion, Carol was clearly pleased with herself—as if she’d known there was history between them. “Abby just moved into the neighborhood, Rick…three houses down from us. It appears that you two have a lot in common, so I’ll leave you to it.” Carol smiled widely before strutting away. “So you’re living on Freedom Avenue now…near these crazy people?” Rick asked. He couldn’t believe it, but his palms were actually sweaty. He looked into her sparkling eyes and experienced arrhythmia for the first time in his life. “I am,” Abby said before looking down at his left hand and then back into his eyes. “You’re not married?” she asked, blushing slightly over the impulsive question. “Then you must have a creep for an ex-husband too?” she teased. Her tone was gentle and there was a soft light playing around her eyes. Abby chuckled and took the seat beside her old friend. Her laugh was absolutely contagious. For a few moments, neither spoke a word. And then Abby’s face blushed again when Rick caught her staring. She looked away. Rick was thrilled over the obvious chemistry between them. Rick cracked open a fresh beer and offered it to her. His hands were almost trembling. No one has ever had this effect on me, he thought. No one. He was legitimately nervous. “Any kids?” she asked, shifting from one hip to the other. Abby’s eyebrow rose in confusion. “Zachary’s my gold fish,” Rick explained, chuckling. Even through the laughter, Abby kept staring. At one point, she slid closer to him. Her presence felt so comfortable and familiar to Rick. “And you… any kids?” he asked. “No. Daddy problems.” She shook her head, the twinkle gone. “Her father hasn’t made a whole lot of time for her lately,” she explained. “Oh, I’m sorry to hear that.” As a light drizzle began to fall, Rick leaned into Abby’s face. She smelled as good as she looked. Abby nodded, but quickly changed the subject. “So how long have you known Carol?” she asked. “Investments. Stocks, bonds… really, really important stuff like that,” he added, sarcastically. “You two still together?” she asked. Rick’s skin tingled over the suggestion. Beneath a wet sky, the rest of the night was spent getting caught up. For Rick, it felt like old times—even though he had no idea who Abby was as an adult. Abby’s mouth twisted slightly, forming itself into a frown; she was clearly touched by the undying love the man had for his wife. Abby nearly cooed at the sweet sentiment. “I’ll never forget his dog, Roy,” she said. Abby was sent into a state of hysterics. Rick shrugged and laughed along with her. “And Grandma?” she asked, regaining her composure. Abby smiled at the familiar phrase. “And she got married,” Rick said. “Yep. His name is Bill Stryker and they’re perfect for each other.” He took another swig of beer. “She still makes me sit for dinner every Sunday.” Rick then asked about Abby’s parents. Rick put his beer on the table and quickly changed the subject. They both laughed. Rick couldn’t stop staring at her great smile and adorable dimples. “Good for her,” Rick said. “But I haven’t heard anything about Grant,” Abby added. “Are you kidding?” Rick said. “I could live a hundred lifetimes and never forget that day!” And without his permission, his mind immediately raced back to the smack of screen doors and the echoes of foolish, barefooted children running toward the future. As a going away gift to Richard and his friends, Jim Giles announced, “I’m treating you all to Lincoln Park.” It was a local amusement park that was famous for its epic Easter egg hunts and The Comet—the largest and most feared roller coaster on the East Coast. The park also had the reputation of hosting some lifelong memories from early spring until late fall. Jim Giles pulled the station wagon into the front of the park and shut off the ignition. From sheer excitement, the back doors flew open and Richard, Abby, Grant, Tracy and Vinny piled out like a trained circus act. They waited. Jim Giles never opened his door. Richard ran around to his father’s window. “Aren’t you comin’, Dad?” he asked, still resentful over their upcoming move. Richard’s father smiled. “Meet me back here at six,” he said, and drove away from the curb. The gang watched as the wood-paneled wagon disappeared into traffic. They looked at each other and smiled. They’d been set loose for one last hoorah. This entire day was going to be their last great adventure together. Past the roller-skating rink and bowling alley out front, they sprinted toward the ticket gate. Murals of smiling clowns holding balloons and lollipops beckoned them inside. A hand stamp cost five dollars and fifty cents and allowed them to ride all the rides for the day. Once paid, the land of thrill seekers, big crowds and long lines opened up to them. “That’s expensive,” Richard blurted, while Grant discreetly talked Tracy into paying his fare. The gang worked its way through the park. Hidden speakers spouting the moans and wails of ghouls and mutants soon had them standing before The Monster Ride. “Looks like Old Lady MacDonald’s place,” Richard said and everyone agreed. Those who dared to ride were greeted by gaudy, lurking statues of hideous creatures with horns, sharp teeth and insane eyes. Of course, to the older, more discerning eye, the giant plaster of Paris knick-knacks were no less than absurd. Richard led his friends toward the unknown. Tracy wouldn’t hear of it. “Come on, Scaredy-Cat,” Grant taunted. It didn’t matter. No matter how much teasing they heaped on, Grant and Vinny were forced to share a car. Abby had already jumped in with Richard. From the moment the car hit the double doors and entered pitch darkness, Abby shut her eyes and never opened them. While hideous mannequins waited in the shadows, the car took jerky turns on a squeaky track. “Eeeek,” Abby squealed, while Richard did his best not to laugh. Through all the screaming, the smells of the midway wafted in, while several rays of sunlight streamed through the cracks in the old, wooden boards. Though these reminded everyone that his or her plight was surreal and only temporary, it still didn’t matter in the belly of the beast. At one point, Abby placed her trembling body against Richard’s. He’d never felt such warmth. His whole body tingled and he instinctively tightened his grip. It was almost a hug. A swarm of butterflies fluttered in his guts, but even in the blackness he couldn’t bring himself to kiss her. He just couldn’t do it. As the car came crashing through another set of double doors and back into reality, Richard and Abby released each other. Through squinted eyes, they exchanged a grin. The crush was their little secret. Once Rick returned to their conversation, he looked hard into Abby’s eyes and his Adam’s apple took forever to travel south. “Those were definitely the days,” he said. “As long as it’s heads up,” he added, with a grin. Between the conversation and shared laughter, the entire night seemed to last all of three seconds. 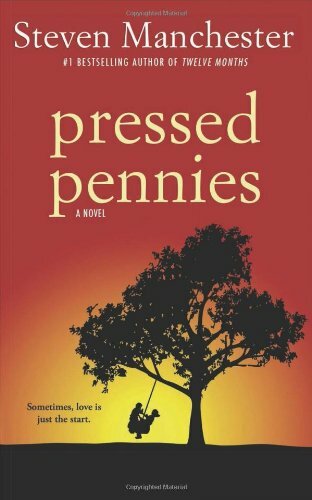 Pressed Pennies is now available at Amazon & Barnes & Noble!